Hello Friends, First let me apologize for the poor photo. This was one of those days where I was a tad rushed. Someone asked me at school to make a quick wedding card that they needed the very next day, so I didn’t get the chance to play around with the lightning. 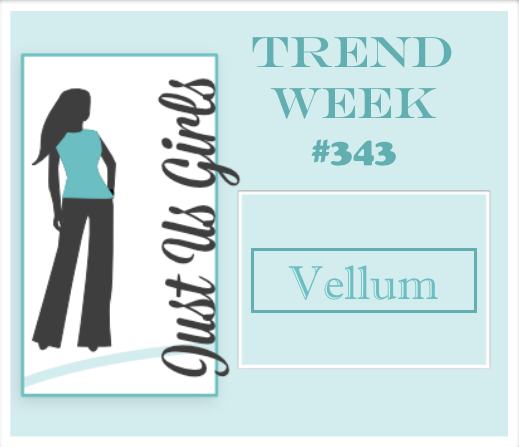 I assure you that the bottom of the wedding dress does indeed have a vellum panel overlay, as the challenge is in fact to use vellum this week over at Just Us Girls. The dress is something I quickly sketched and traced, the EF makes a nice touch to the dress don’t you think? I used a MS punch to create the bottom scallop and the white flowers are also made with a MS punch as well. The sentiment is heat embossed on vellum and is from Stampin Up. I added a piece of ribbon, some hearts, and rhinestones and I was finished. I have seen many variations of a wedding dress like this over on Pinterest, so the original idea is not my own. Categories: Cards | Tags: bridal shower, Card making, Cards, embossing, rubber stamps, stamping, wedding card | Permalink. That is a gorgeous wedding card. Wait! You just sketched this? Love all of the elegant texture that you added to this one. A magnificent quick card for a friend. Oh, wow!! Vellum is a perfect medium for a wedding card. This dress is gorgeous…you clever girl to design it yourself. LOVE the popped up flowers and the vellum greeting too. A stunning card, your friend will be please with the result! How adorable is this card?!! I just love it! I love this! Very clever to add a flowers on the dress over the EF! each delicate detail is perfect!! so much pretty detail here! Absolutely beautiful, love the wedding dress and the vellum is the perfect way to use vellum without loosing the beauty of the card design. Nancy, you sketched this dress? I am so impressed! I can barely draw stick figures!! 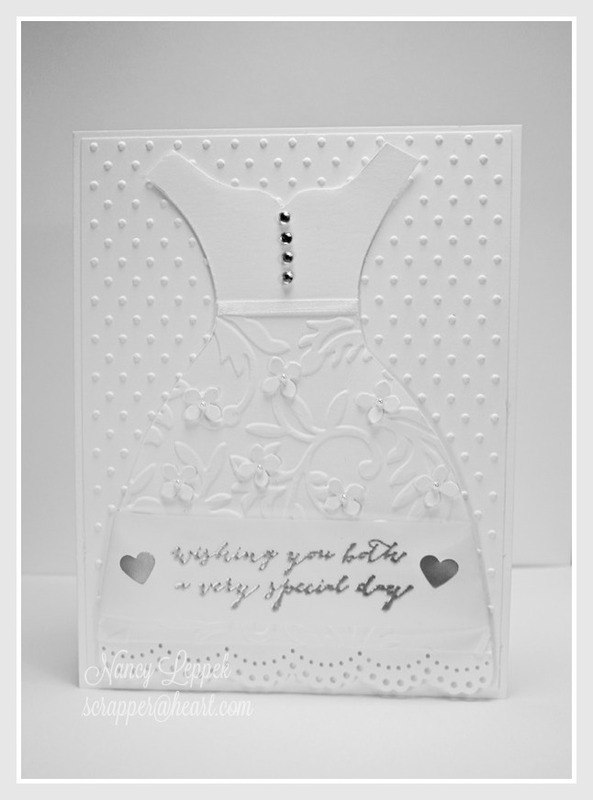 Beautiful card, love all the white on white and with your added texture it makes a beautiful and impressive card!! I think I will play along again!! Thanks so much Colleen! Have an awesome day!! What a beautiful bridal card! Great job with the challenge! Beautifully done! What a fun wedding card! Can’t believe you designed this…..so pretty. Love the embossing too. Such a simple design but a stunning result. Just a perfect wedding card. Such class and style. Love it Nancy. Nancy, this is stunning! I love the texture on the dress as well as the background. I am totally impressed that you drew the dress and didn’t use a die. A perfect wedding card! You are so welcome Linda! Ty and I had a fabulous time, it was just to short! Thanks for your sweet comment on my card! Take care! So chick Nancy. Loving the silver trimmings which gives it a lovely sparkle. Wonderful embossing.